Does God Need to be Served? God doesn’t need anything does He? So how are you gonna serve God, when He’s absolutely self-sustaining, and without even one need? If we can’t serve God’s needs, because He doesn’t have any, then what can we serve, in respect to God? How about God’s desires, can we serve that? Does God even have any desires? The bible actually says that He does. What comes to my mind is 1 Timothy 2, verses 3 & 4; “This is good and acceptable in the sight of God our Savior, who desires all men to be saved and to come to the knowledge of the truth.” So there’s a “desire” that God has. That all men (and that means all people) would be saved, and come to a knowledge of the truth. Some people get the idea from the words, “destined”, and “appointed”, that God has already ordained what our final destiny will be. But the fact is, our destiny depends on us. It depends on our obedience, or, our lack of obedience, to God’s word. A much better word to use in that verse is the word “purposed”. The verse would then read.. “God has not PURPOSED us for wrath, but He has PURPOSED us to obtain salvation through our Lord Jesus Christ.” And that’s in perfect harmony with 1 Timothy 2:4, which says that God “would have (or, “desires”) all men to be saved”. God would have it that way, and He desires it to be that way, and He has purposed it to be that way! That’s why God created us; So that we could be saved through Jesus Christ, and live eternally with Him, in heaven. Sure He knew we would sin. That’s the purpose for the plan of salvation! That’s why the plan of salvation was already established from eternity. Ephesians 3:8 talks about the preaching of “the unfathomable riches of Christ”, which of course is, the plan of salvation. And verse 11 says; “This was in accordance with the eternal purpose, which he accomplished, in Christ Jesus our Lord.” The “eternal purpose” isn’t the literal wording there, but rather, it’s “the purpose of the ages”. It’s the purpose for all ages. It was purposed even before the ages began! And so, it is the “eternal purpose”. Man’s salvation from sin, has been God’s purpose, and His intent, and His desire, from eternity. So then, is there a way that we help to “serve” that purpose of God.. “For all men to be saved, and come to the knowledge of the truth”? We not only CAN serve that purpose, but a part of God’s eternal purpose, is that we DO serve toward that goal. Ephesians 2, verse 10 says; “For we are His workmanship, created in Christ for good works, which God prepared beforehand, that we should walk in them.” That’s God’s purpose, for us; to walk in the “good works”, that have been purposed and “prepared beforehand”. It’s the “purpose of the ages”. The “good works” spoken of in that verse, is the “service” that we were created for. That’s how we “serve God”. We “serve” as we take part in fulfilling God’s purpose. The bible says that same thing, in various, and different ways. In Ecclesiastes 12:13, it says it in this way; “Fear God, and keep His commandments, for this is the whole of man.” The “whole of man”, is the very purpose of man. Now, the word “Religion”, in that verse, refers to our reverence, and worship of God. And it’s that reverence, or that respect of God, which motivates us to obey God “Religion” therefore, is simply obeying God. And if it’s obeying god, then it’s also serving God. “Pure and undefiled religion” is.. “to visit orphans and widows in their affliction”. In other words, “pure religion”, is to serve others. The word “visit”, means.. “to provide for”. And so “visit” means to serve. “Pure and undefiled religion” is serving others. And it also means to keep ourselves from sin, but let’s focus on the part about serving others. Religion is serving, it’s working the works of God. It’s completing the works that Jesus began, when He was on earth. How do we serve God? We do it in two ways. First, we serve God by keeping His commandments (which will also keep us from sinning). By keeping His commandments, we are “serving Him”. 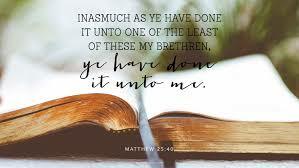 And second, we serve Him, by serving others, (which is also a matter of keeping His commandments). So then whether your service is directed specifically toward God, in worshipping Him, or in praying to Him; Or if your service is specifically directed toward others, it’s still “serving God”. How can we serve others? We can serve them by teaching them, or by helping them financially, or by helping them with physical labors, or by being an emotional and moral support, or in whatever way, someone might need help. Whether our efforts are directed at God or directed at others, we’re still “serving God” no matter what. I guess when you think about it, the only time, that you’re not serving God, is when you’re simply serving yourself. It might be hard for us to admit, but when we really think about it, the majority of our time, is probably spent, serving ourselves. We probably think that if we take a little bit of time, a couple times a week, and devote that to helping someone else, we probably think we’ve done a lot. That we’ve sacrificed a lot. But listen to what Romans 12, verse 1 tells us t do; “Present your bodies, a living and holy sacrifice, acceptable to God; Your spiritual service of worship.” That kind of sounds like it might be a full-time deal. Your “spiritual service of worship”, is your spiritual reverence, and obedience to God! To “present your bodies”, is to offer your bodies, as the vehicle by which your spirit can “work the works of Him” who sent Jesus Christ. Jesus began those works, and we must continue those works, until the end of time. Isn’t that what remaining faithful unto death is? Isn’t that what enduring is? It’s working those works of God, until we die, or until we can physically no longer do it. It sounds like it’s our full-time job. I know, the work that we do for a living is our full-time” job. And we typically think that when the work day is over, that now all the rest of the time is ours. But I’m not so sure that the rest of the time isn’t God’s! Religion, and serving God, and keeping His commandments, and working the works of God, and walking in the good works prepared beforehand; They all mean the same thing. That’s “the whole of man”! So many people find it so difficult to reconcile faith in God, with the reality of wars, and starving children, and people displaced from their homes. But what they fail to understand, and accept, is the fact that none of these things would exist, if all the people of the world, would serve God and serve man. I’m quite sure that there is enough food in the world, and there’s enough money in the world, for all the hunger and homelessness, and all those related things, to be done away with. The problem is that nearly all the people are too busy serving themselves, to even think about serving God. And the rest of the people are to busy trying to figure out how to BE served, instead of how THEY can serve. And then everyone wants to blame God for the condition of the world. Hasn’t God already given us the answer to the problem? The problem is, that everyone wants to be SERVED, and the answer is, for everyone to BE, the SERVANT! Now even though Jesus was speaking to His disciples, those instructions are really meant for the whole world, aren’t they? The worlds problems would all but disappear, if everyone came to serve! There’d still be sickness, because we’ll never be immune to that. But there’d be a lot LESS sickness. Can you imagine what this world would be like if all the money that the world possesses, would be used to help the sick, and to prevent sickness? Would there be even one hungry person left in the world, if all the food in the world was actually used, to feed the hungry? And would there be even one needy person left in the world, if all the money that the world possesses was used to fill all those needs? God ordained that man should “subdue” the earth, and look what we’ve done. And then think about what we could do, if everyone would just serve like we’re supposed to. The word “serve” means.. “to minister to the needs of others”. And it specifically means to minister to those needs, as the Lord directs. Remember that word “visit” from James 1:17? “Visit orphans and widows..” That word means.. “to look upon, in order to provide benefits”. Do you know what the Greek word “agape” means? That’s the word used in 1 Corinthians chapter 13, the chapter on “love”. “Agape” as it’s used there, means.. love, which means charity, which means benevolence. We all know what benevolence is. It’s ministering to others. It’s providing for the needs of others. It’s serving others. Did you know that “agape” is said to be strictly a biblical and ecclesiastical word? It specifically refers to the attitude of the heart that God teaches us to have. An attitude of servitude. An attitude of putting others needs, before our own needs. “You shall love, the Lord thy God, with all thy heart, and with all thy soul, and with all thy might.. and you shall love, thy neighbor as thyself.” (Mark 12:30 & 31) You shall serve God, first and foremost. And then you shall serve your neighbor. And then, if you have anything left to serve, when everyone else is served, you can go ahead and serve yourself. That’s how we truly serve God. Few are those who are willing to serve, and not to be served!